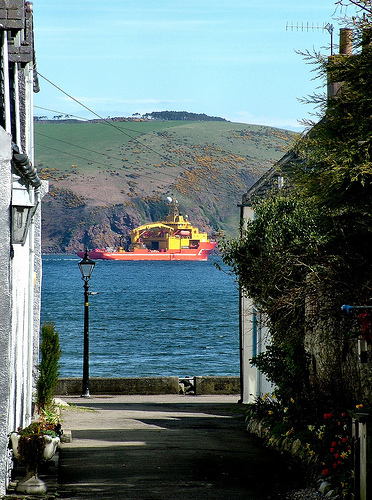 Cromarty is the sort of place where you can exert yourself as much or as little as you wish. For those of an energetic bent, climb the 'Hundred Steps' to the South Sutor, go mountain biking or sea kayaking. If you appreciate wildlife, book a dolphin-watching boat trip from the harbour or spot some birds along the shore or in the nearby fields. If you are interested in Cromarty's past, venture into Hugh Miller's Cottage or the Courthouse Museum, then take a Cromarty audiotour and view 300 years of Scottish vernacular architecture and 'meet' a few of the town's more peculiar inhabitants. Or, with no particular purpose in mind, meander along the Links (stopping to look at the Emigration Stone), see what's happening at the Harbour and nip into the Cromarty Bakery for a tasty bun. Wherever you go in Cromarty, be prepared for the unexpected: a sudden gust of wind in the face as you turn a corner, a change of perspective as you view a familiar sight from a different angle, or a view such as this when you turn into the Vennel and a ship in the Firth seems within the hand's grasp.